Moroccan Kilims – Sought after for their worldly, well-traveled appearance, Moroccan kilim rugs are more popular than ever. Modernists like Eames and Frank Lloyd Wright, who are synonymous with the mid-century, skillfully incorporated Moroccan kilim carpets into their pioneering designs. Colorful Moroccan kilim flat weave rugs decorated with graphic patterns and tribal symbols are still featured prominently in the most iconic mid-century homes. Today, new generations of designers and trend setters are discovering the versatility and eclectic beauty of the Kilim rugs that were woven in Morocco. The strong geometric patterns and intricate woven textures featured in mid-century Moroccan Kilim rugs are indispensable design assets. From the mid century designer duo of Eames to award-winning modern contemporary designers, many great stylists find that Moroccan kilims are the perfect accompaniment to classic, modern or eclectic mid-century furnishings. For those that are looking for great value when shopping for rugs, the flat woven Moroccan kilims are phenomenal options. These beautiful textile art kilims from Morocco are extremely artistic, have the beautifully aged patina, each example is a unique one of a kind and they are still prices relatively low and even comparable or lower priced than their newer more commercial counterparts (like the more commercial “Moroccan inspired” kilims and rugs that new would find in restoration hardware). So if you are looking for affordable thin textured flat weave carpets that have a more modern approach to their designs and patterns, the vintage mid century modern Moroccan kilims will be extremely hard to beat! 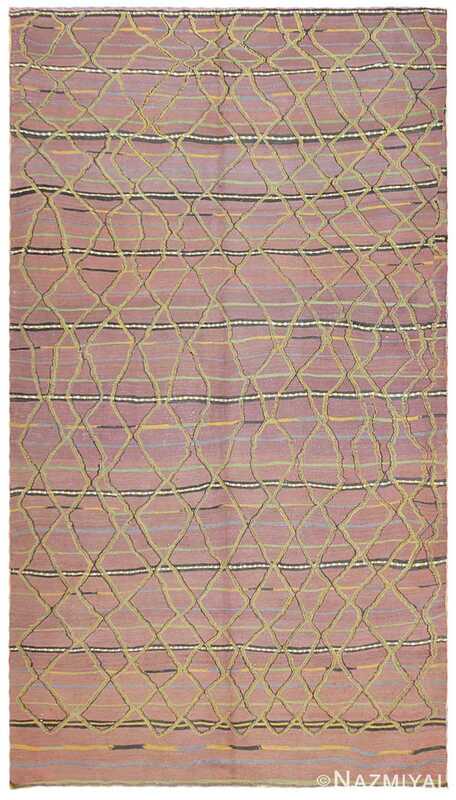 Simultaneously creative, innovative and traditional, this eclectic mid century vintage Tribal design Moroccan runner rug features a tufted latticework pattern set over a striped flat-woven field. Spectacularly decorated, this phenomenal north African rug, a vintage Moroccan Kilim carpet, features a graphic pattern of flat-weave stripes adorned with minute symbols and decorative accents. 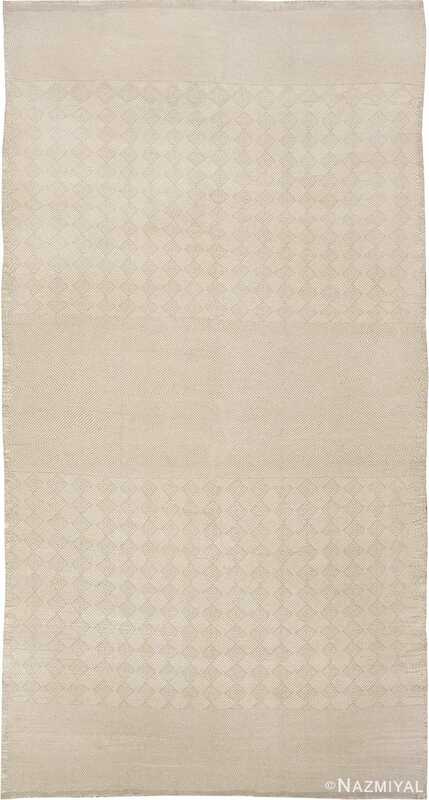 The modern style and nuanced textures of Morocco's iconic flat-weave patterns are exemplified in this beautifully composed vintage mid-century Moroccan Kilim. Stunning sunset stripes incorporating billowing segments of azure, ivory and crimson set over saturated blue bands create an intimated land and sky composition. Created in Morocco, this handsome vintage rug features a stark stripe pattern with broad walnut brown sections and clear ivory bands decorated with ancient symbols. Mysterious yet modern, this bold vintage Moroccan Kilim depicts a casual composition that features graphic stripes layered with a scattered repeating pattern. 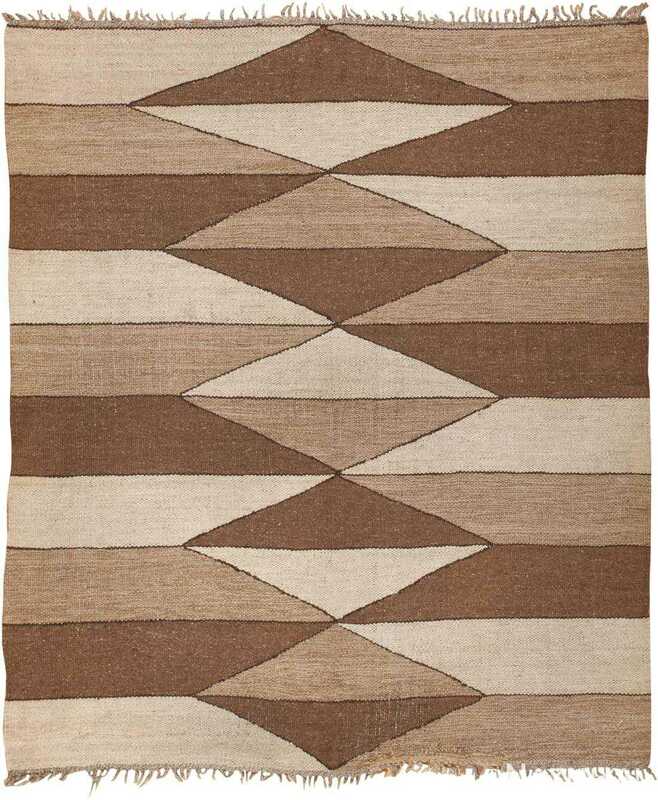 This chic vintage Moroccan Kilim features an abstract pattern of expressive stripes and geometric decorations rendered in a harmonious achromatic color scheme. Crafted in Morocco, this delightful vintage mid-century rug features an elaborate series of intricate flat-weave patterns that are bound by monochromatic stripes. 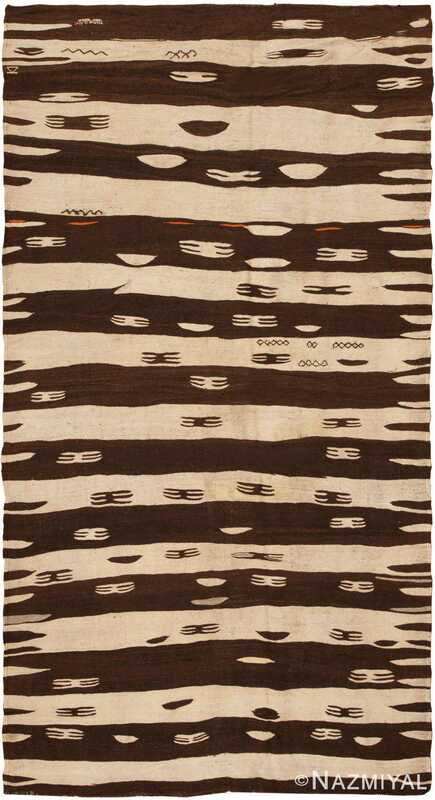 This vintage mid-century Moroccan rug features a graphic flat-weave pattern of monochromatic stripes emblazoned with crisp hash marks and enigmatic tribal symbols. 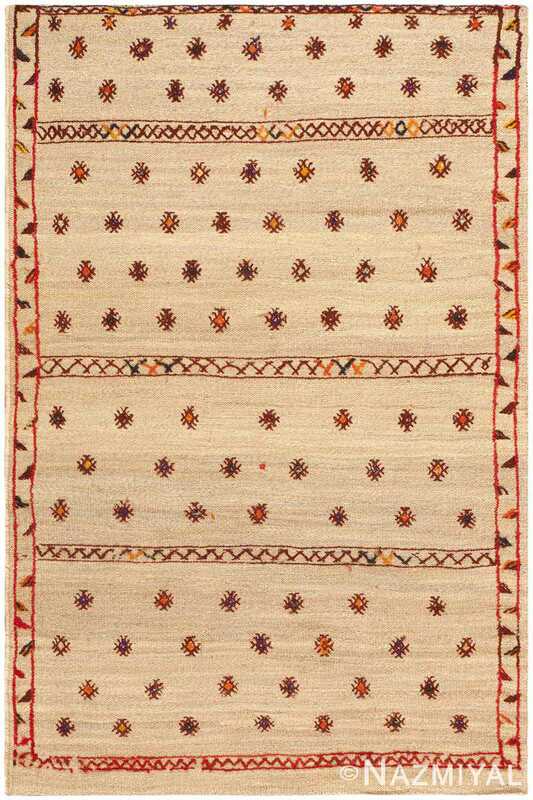 A fetching piece, this vintage kilim is characterized by a lovely design that represents some of the finest qualities of mid-century Moroccan weaving. 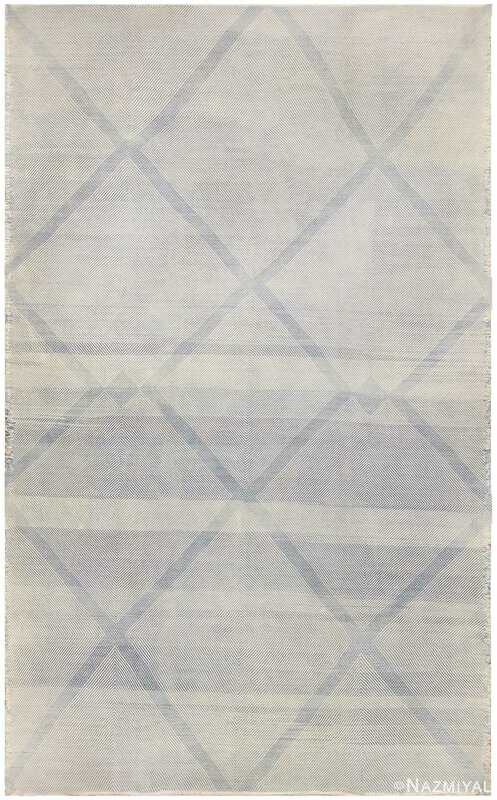 This Oriental-influenced Moroccan rug integrates the power of opposite colors. Lime-green lines form an organic complex of strings over a mauve background scene. 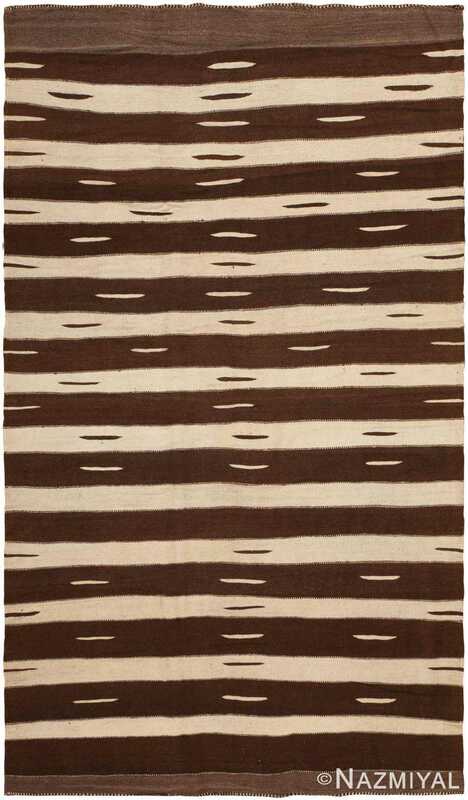 Abbreviated stripes and birdlike accents rendered in a stark combination of walnut brown, ivory and splashy colors decorate this outstanding vintage Moroccan kilim. 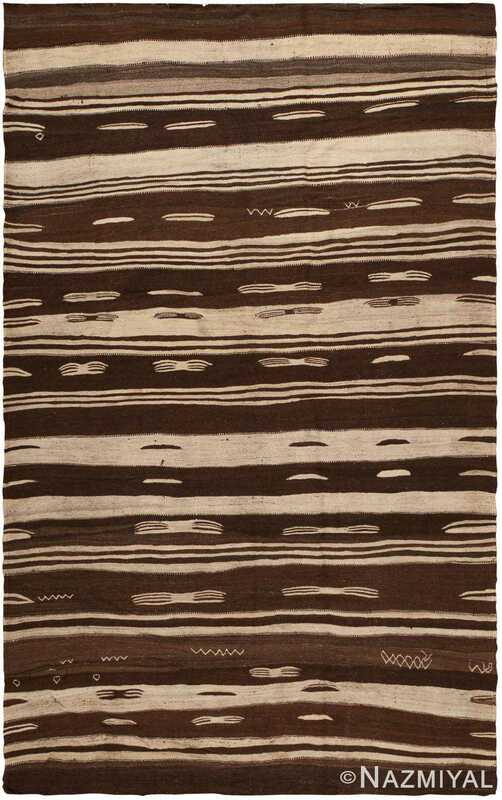 With its rugged, earthy tribal appearance, this delightful vintage Moroccan Kilim is the perfect unexpected accessory for outfitting modern or rustic interiors. Known for their naturally modern style, this Moroccan kilim features a simple stripe pattern inventively colored with a variety of dimensional neutral shapes. This vintage mid-century Moroccan rug features a bold compartmental field with a muted sisal background adorned with brightly colored symbols and wool accents.